At around 6.00 a.m in the morning, the Pune (Maharashtra) police conducted simultaneous raids at the homes of prominent activists in Maharashtra namely Sudhir Dhavale (Dalit activist, Republican Panthers), Harshali Potdar (Activist, Republican Panthers), Ramesh Gaychor, Jyoti Jagtap, Sagar Gorkhe, Rupali Jadhav and Dhawala Dhengle (all Kabir Kala Manch activists) allegedly in relation to the violence that ensued after the bi-centenary celebrations of the battle of Bhima-Koregaon on 31 Decemeber 2018 and the subsequent bandh. Alongside, Pune Assistant Commissioner of Police, Ganesh Gawade, and Nagpur DCP, Suresh Bawche, searched the residence of prominent people’s lawyer, Surendra Gadling. On 31st December 2017, an Elgar Parishad was organised to commemorate the 200th anniversary of the battle of Bhima-Koregaon which was attended by thousands who gathered to raised their voice against the forces of Bramanical Hindutva Fascism. On the following day, that is, 1st January 2018, a mob carrying saffron flags instigated by Sambhaji Bhide and Milind Ekbote attacked the masses and activists who had gathered for the commemoration. 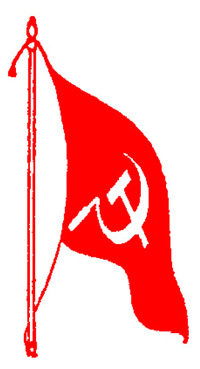 It should be noted that instead of taking timely action against those who incited and perpetrated violence that ensued after the Elgar Parishad, the state machinery has chosen to devote its time and attention to target and harass activists and lawyers who have been speaking against the anti-people policies of the government. Both the main forces behind the pre-meditated violence on 1st January 2018, Sambhaji Bhide and Milind Ekbote, are right wing activists closely connected with the ruling BJP and the Sangh Parivar. The police forces have failed to arrest Sambhaji Bhide in connection with this case. Rather, they seem interested in conjuring up an elaborate tale of how the songs of peoples’ resistance sung by activists at the commemoration on 31st December were deliberately intended to incite violence! Allegedly under the same pretext of investigating the Bhima Koregaon incident, a team of Pune police led by Deputy Commissioner of Police Pravin Munde and investigating officer, Shivaji Pawar searched the residence of Rona Wilson in Delhi by arbitrarily trying to frame him under the Sections 153 a, 117, 505 1 (b), 34 of the IPC. The police has seized his laptop, phone, books and some money from his residence under the pretext of this arbitrary raid. Rona Wilson has been an activist for several years, advocating for the cause of political prisoners all over India. As Public Relations Secretary of the CRPP, he has been at the forefront of organising numerous conventions against the unconstitutional nature of draconian laws like UAPA and AFSPA, and against the arbitrary use of death penalty, specifically against Muslims and Dalit minorities. He is an active voice in the campaign for the release of political prisoners condemning the anti-people ploys of the state machinery for arbitrarily persecuting minorities and marginalised sections. That these raids are happening at a time when voices of Dalit resistance are transforming into an avalanche of resistance against the anti-people policies of the state indicates the deliberate attempt by the powers that be to stifle all voices of protest. Moreover, it exposes the brazen vengeance of the state against Dalit upsurge organising against the unbridled loot and plunder of resources by imperialist capital aided by the forces of Hindutva Fascism. By targeting activists and peoples lawyers, the state is blatantly trying to snuff out even voices of defense from political prisoners. It must be understood that violence that ensued in Bhima Koregaon is being used as an alibi by the ruling classes to browbeat activists and lawyers who have been fighting for the people into silence. These pre-meditated raids reflect the desperation of the increasingly police state and its growing tendency within the executive to frame activists and lawyers under false charges and keep them in confinement under prolonged incarceration. It must also be highlighted that this arbitrary and illegal search has come at a time when CRPP has been able to gather public opinion against the conviction of Dr. GN Saibaba, Hem Mishra, Prashant Rahi, Vijay Tirki, Mahesh Tirki and Pandu Narote. The Gadchiroli Sessions Court, in its 827 page judgment, inadvertently exposes the workings of a national security state which uses the instrument of law to thwart dissent. It is not a coincidence that when retired judges and prominent lawyers have agreed to speak at a convention (proposed for April 22, 2018) condemning the Gadchiroli Sessions Court judgement, the state machinery has used the pretext of the Bhima Koregaon incident to harass Wilson in order to divert the attention of the public and stop their mobilisation against the judgement of Gadchiroli Sessions Court. 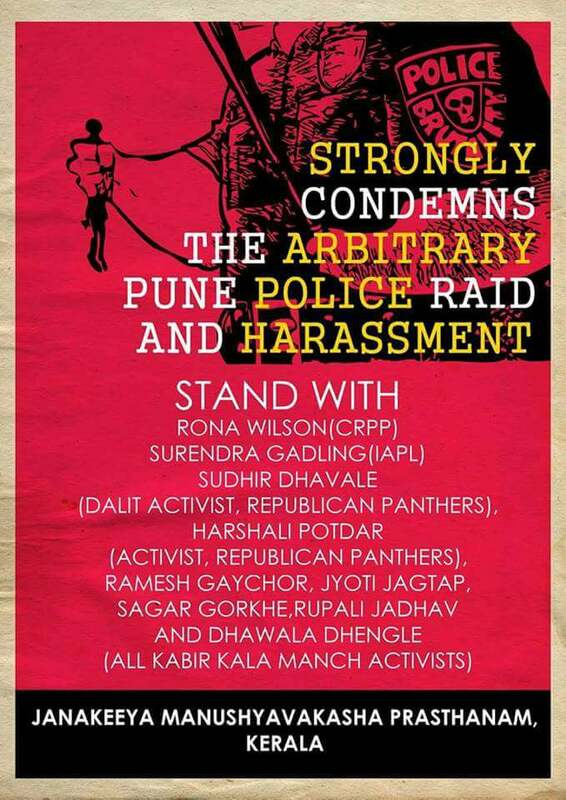 The CRPP strongly condemns the arbitrary police raid conducted at the residence of Rona Wilson and other activists from Maharashtra which is nothing but a tactic to intimidate activists and prevent them from mobilising people and raising voice against the violence perpetrated by the state.